ESPN on ABC (known as ABC Sports from 1961 to 2006) is the brand used for sports event and documentary programming televised on the American Broadcasting Company (ABC) in the United States. Officially, the broadcast network retains its own sports division; however, for all practical purposes, ABC's sports division has been merged into ESPN Inc., the parent subsidiary of cable sports network ESPN that is majority owned by ABC's corporate parent, The Walt Disney Company, in partnership with the Hearst Communications. New ESPN on ABC logo, introduced in 2013. Like its longtime competitors CBS Sports and NBC Sports, ABC Sports was originally part of the news division of the ABC network, and, after 1961, was spun off into its own independent division. When Roone Arledge came to ABC Sports as a producer of NCAA football games in 1960, the network was in financial shambles. The International Olympic Committee even wanted a bank to guarantee ABC's contract to broadcast the 1960 Olympics. At the time, Edgar Scherick served as the de facto head of ABC Sports. Scherick had joined the fledgling ABC television network when he persuaded it to purchase Sports Programs, Inc., in exchange for the network acquiring shares in the company. Scherick had formed the company after he left CBS, when the network would not make him the head of its sports programming unit (choosing to instead appoint former baseball public relations agent William C. McPhail). Before ABC Sports even became a formal division of the network, Scherick and ABC programming chief Tom Moore pulled off many programming deals involving the most popular American sporting events. As ESPN has signed new contracts with various conferences to produce college football coverage, the network has begun branding its coverage of select conferences to which it has rights. This branding was first seen on SEC broadcasts in 2011, which became the "SEC on ESPN". ACC broadcasts followed suit in 2012 becoming the "ACC on ESPN". Despite the fact that ACC games also air on ABC, the games remain branded as the "ACC on ESPN" regardless of network. In 2016, a new contract brought conference branding to Big Ten telecasts as well, which air on both ESPN and ABC. While Big Ten games that air on ESPN cable channels are branded as the "Big Ten on ESPN", games airing on ABC are now branded as the "Big Ten on ABC". The next year, in 2017, the Pac-12 Conference began branding their games under the title, "Pac-12 on ESPN". While the program is still officially part of ESPN College Football which is reflected when talent appears on screen, the Big Ten on ABC logo and branding is used for intro, program IDs, and replay wipes. This is the first time any regularly scheduled sporting event outside of the National Spelling Bee has carried any ABC branding since 2006. Also starting with Saturday Primetime in 2017, live NBA game action no longer shows the ESPN identification on screen. Previously under ESPN on ABC (since 2006–07), the ESPN logo was part of the score banner, while the ABC logo was separately floating on the right side of the screen, remaining on screen during replays. The version of the new 2016–17 graphics package used on ABC replaces the ESPN logo in the score banner with several stars, while the ABC logo (still constantly on screen) anchors the right side of the banner; however for the 2017–18 season, the ESPN logo was reintroduced onto a revised version of the score banner with the ABC logo still located to the right. In addition, commercial transitions for ABC games now contain the ABC logo. It is the first time NBA games on ABC don't have ESPN identification during live action since the 2006 NBA Finals. Despite the rebranding, ABC Sports continues to exist, at least nominally, as a division of the ABC network. One indication of this was the retention of George Bodenheimer's official title as "President, ESPN Inc. and ABC Sports" even after the rebranding – the second part of the title would presumably be unnecessary if ESPN had fully absorbed ABC's sports operations – though following Bodenheimer's retirement and the subsequent appointment of John Skipper at the end of 2011, the title was shortened to "President, ESPN Inc." In addition, ABC itself maintains the copyright over many of the ESPN-branded broadcasts, if they are not contractually assigned to the applicable league or organizer, suggesting that ESPN has merely "loaned" usage of its brand name, staff and infrastructure to ABC, rather than having acquired ABC Sports outright. ABC News Radio also continues to brand its short-form sports updates as ABC Sports Radio; this service is separate from the ESPN Radio network. This is likely a minor technicality stemming from ESPN being technically a joint venture between Disney (which owns an 80% controlling interest) and the Hearst Corporation (which owns the remaining 20%). Disney has long exercised operational control of the network, while Hearst is believed to be more of a silent partner rather than an active participant in ESPN's management. However, this relationship does mean that Hearst's ABC-affiliated stations – such as WCVB-TV in Boston; WMUR-TV in Manchester, New Hampshire; WTAE-TV in Pittsburgh; WISN-TV in Milwaukee; WPBF-TV in West Palm Beach; and KMBC-TV in Kansas City – have right of first refusal to local simulcasts of ESPN-televised Monday Night Football games involving home-market teams, which are very rarely waived to other stations within their markets. Equally, other Hearst-owned stations such as NBC affiliates WLWT-TV in Cincinnati, WBAL-TV in Baltimore, and WDSU-TV in New Orleans have been able to air NFL games from ESPN for the same reason (independent station WMOR-TV in the Tampa market is also eligible to air these games, but rarely if ever does so). ESPN and The Walt Disney Company have been criticized for decreasing the amount of sports programming televised on ABC. Several ABC affiliates have also voiced opposition regarding the increasing migration of live sporting event telecasts from ABC to ESPN. The decrease in sports events televised by ABC has resulted in the network having a very inconsistent weekend afternoon sports schedule similar – if not somewhat equal – to Fox in previous years (and to some extent, to this day,[when?] even with the expansion of sports coverage on Fox since 2011); ESPN-produced sports specials (aired as part of the 30 for 30 and E:60 anthology series) and/or more recently, figure skating and gymnastics specials supplied by Disson Skating (a subsidiary of independent production company Disson Sports & Entertainment) as well as syndicated programs or infomercials scheduled by the network's owned-and-operated stations and affiliates fill the weekend afternoon schedule on days when the network is not scheduled to air a sporting event; until 2014, ABC-supplied rerun blocks of certain prime-time network shows and occasional theatrical film telecasts have also filled the schedule on weekend afternoons without a scheduled sports event. As a consequence of this, ABC turned over an hour of its then-existing two-hour Sunday afternoon block (from 4:00 to 5:00 p.m. Eastern Time) to its affiliates on June 21, 2015, reducing its Sunday schedule on weeks without major sporting events to one hour; the 5:00 p.m. (Eastern) hour that was retained is usually reserved for rebroadcasts of ESPN sports documentaries. However, as of January 2016, ABC rescinded the remaining hour of its Sunday afternoon schedule (5:00–6:00 pm Eastern Time) back to its affiliates thus leaving ABC without a Sunday afternoon block (save for major sporting events). This exclusively relegated ABC's sports schedule to Saturday afternoons (and by extension, ABC's non-news weekend schedule to 3:00 to 6:00 pm and 8:00 to 11:00 pm on Saturdays and 7:00 to 11:00 pm on Sundays). ABC's in-house network-programmed Sunday schedule not counting news-related programming as a result of this is now exclusively relegated to its four-hour prime time block (from 7:00 to 11:00 pm). In the past few years,[when?] ABC gave up several lucrative sports contracts. It gave up the rights for the American Le Mans Series in 2013 when it merged with the Rolex Grand Am Series to form the WeatherTech SportsCar Championship and subsequently moved to Fox. It also ended its FIFA coverage with rights also being transferred to Fox one year later in 2014. It then lost the NASCAR broadcast rights the same year with the rights being picked up by NBC. Also, it phased out the last of its college basketball coverage also in the same year (the SEC Men's Basketball Tournament) with the tournament being moved to the ESPN cable networks. It also gave up its highlights show relating to the British Open golf tournament one year later. In 2016, ABC ended its regularly scheduled doubleheaders for its NBA Sunday Showcase, opting to opening up a window for Saturday night games and leaving single games on Sunday afternoons in most cases. In addition, ABC discontinued airing Grantland-related programming when the brand shut down operations in October. 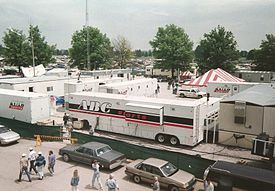 The network also lost rights to broadcast the IndyCar Series, including the Indianapolis 500, in 2018 with the rights moving to NBC Sports (moving the race away from ABC after 54 years); coincidentally in that same year, ABC will air several Formula One races a year after ESPN acquired the F1 rights from NBC Sports. ESPN has announced[when?] they will simulcast an NFL Wild Card Playoff game on ABC starting in 2016, marking the first time ABC will have an NFL game since Super Bowl XL. Additionally, ABC simulcast ESPN's coverage of rounds 4-7 of the 2018 NFL Draft. NFL Draft (2018–present): simulcast of ESPN's 2018 NFL Draft Coverage of Day 3, Rounds 4–7; simulcast of all of the Draft starting in 2019. ^ Deitsch, Richard (August 10, 2006). "Worldwide leader expands". Sports Illustrated. Archived from the original on August 23, 2006. Retrieved January 18, 2016. ^ "'ESPN on ABC' to debut during college football season". ESPN. ESPN Inc. Associated Press. August 10, 2006. ^ Mike Meserole (December 6, 2002). "Arledge Created Monday Night Football". ESPN Classic. ESPN Inc. Retrieved May 30, 2011. ^ "Roone Arledge at the Encyclopedia of Television". Museum of Broadcast Communications. Retrieved March 30, 2015. ^ "Roone Arledge". Columbia College. June 18, 2008. Retrieved July 7, 2013. ^ Richard Sandomir (June 10, 2015). "Without Showing Games, ESPN Leaves a Mark on the N.B.A. Finals". The New York Times. The New York Times Company. Retrieved June 12, 2015. ^ Robin Miller (July 12, 2012). "Miller's Mailbag, 7.12". Speed. Fox Sports Media Group. ^ Michael Cieply; Brian Stelter (November 22, 2011). "Disney Promotes a New Leader at ESPN". The New York Times. The New York Times Company. Retrieved October 7, 2012. ^ "WGN-TV To Carry Monday Night's Bears/Cowboys Game, Plus Local Pre-Game Show". Chicagoland Radio and Media. October 7, 2012. ^ Jon Consoli (February 9, 2010). "ABC affiliates upset about losing sports to ESPN". Reuters. Retrieved September 17, 2011. ^ "ABC adds 14 new shows for next season". WJLA-TV. Allbritton Communications Company. Associated Press. May 14, 2013. ^ "NBA on ABC Broadcast Schedule". National Basketball Association. Retrieved January 4, 2016. ^ "NFL Wild Card Playoff Game Will Return to ESPN – and Be Simulcast for the First Time on ABC". ESPN. Retrieved January 4, 2016. ^ "Picture perfect: ABC now full 16:9; TVs might need to be updated". WBRZ.com. Louisiana Television Broadcasting, LLC. Retrieved September 22, 2016. ^ "Marty Reid Fired: ESPN Replaces NASCAR, IndyCar Announcer After Nationwide Gaffe (VIDEO)". The Huffington Post. September 29, 2013. Retrieved September 29, 2013. ^ "Dennis Swanson Retires as ABC Sports President". Philadelphia Inquirer. April 11, 1996. ^ "Bornstein to lead ABC". The Telegraph-Herald. April 12, 2001. Retrieved May 15, 2012. ^ "Howard Katz resigns as ABC Sports President". ABC Sports. ESPN.com. April 18, 2003. Retrieved May 15, 2012.